“8 Attitude P's that are Keys to Living a Successful and Meaningful Life” from Christian Faith Publishing author Gregory Miller is a wonderfully written guide that will lead the reader to a better understanding of living a Godly life. “8 Attitude P's that are Keys to Living a Successful and Meaningful Life”: a tried and true set of attitude adjustments that will make it easier to connect with God’s truths. “8 Attitude P's that are Keys to Living a Successful and Meaningful Life” is the creation of published author, Gregory Miller, a dedicated writer and gifted author. Published by Christian Faith Publishing, Gregory Miller’s new book introduces the reader to the eight P's: Prayer; Positivity; Preparation; Practice; Persistent; Proactive; Practical; Patience. The author uses these to connect with God's truths. All eight of these attitudes or mindsets have been the most critical contributors to his transformed life. This book ministers to those searching for the truth, in a way all can understand. In this book, Gregory is preaching and teaching with the reader, and not at the reader. This can easily be considered a manuscript written in an "I've been there and done that" type of way, that is empathetic and non-judgmental. View a synopsis of “8 Attitude P's that are Keys to Living a Successful and Meaningful Life” on YouTube. 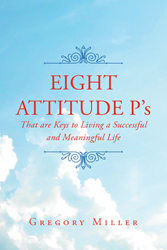 Consumers can purchase “8 Attitude P's that are Keys to Living a Successful and Meaningful Life” at traditional brick & mortar bookstores, or online at Amazon.com, Apple iTunes store, Kobo or Barnes and Noble. For additional information or inquiries about “8 Attitude P's that are Keys to Living a Successful and Meaningful Life”, contact the Christian Faith Publishing media department at 866-554-0919.